Writing with Sources: Intermediate Essay is a class for the student who has some mastery of the basic essay and its variations and is comfortable with introductions, conclusions, thesis statements, and strong support of those thesis statements. In this class, we take the next step: learning to write using sources. Categories: Writing, Teen Focus, Spring 2018, Spring 2019. Incorporating the words and ideas of texts and experts challenges writers, as they need to learn to lead with their own idea and use the voice of the text or experts to support their idea without taking it over. 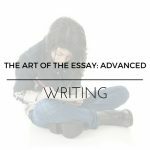 This class teaches that next step of academic essay writing, incorporating plenty of opportunities to examine how other essay writers have managed the task while putting the skills to practical use. Additionally, critical thinking skills will be reinforced and encouraged in both writing and source selection. Across the semester, students will write essays and other assignments using techniques from class and outside sources. Teacher feedback guides each writer through the process. Emails from students are always welcome and will be answered promptly, with a focus on specific feedback that helps a writer grow throughout the class. This class prepares students for further academic writing within Online G3 and beyond. While this class is excellent preparation for participation in the optional writing supplements, it can also be taken concurrently with or after completion of a writing supplement to further a student’s writing skills. They Say, I Say: The Moves That Matter in Academic Writing with Readings, 4th edition, by Graff, Birkenstein, and Durst. Please be very careful to get ISBN 978-0-393-64329-9 or Ebook 978-0-393-68070-6 only, as other editions do not include all of the required readings for the class. If your leaner is still mastering some of the skills above or the basic essay form, Essay Essentials is recommended. Writing with Sources is a Teen Focus class for ages 12 and up. Prerequisites: Essay Essentials or equivalent. Strong grammar skills and previous essay writing experience is required. Concurrent enrollment in a Magic Lens Grammar/Vocabulary class is encouraged.